Today's post is a personal one. My baby turned 19 today. It's so hard to believe that it's been 19 years since he came into our lives. We had a really good day and I'd like to share it with you. When we asked Cameron what he wanted to do on his birthday this year he said that he wanted to go the 6th Floor Museum and Dealey Plaza. As most of you know John F. Kennedy was shot and killed in Dallas on November 22nd which happens to be Cam's birthday. Cameron has always had an interest in history and a month or so ago there were several programs on the History Channel about JFK and the assassination. This resparked his interest about the event. Today was the 45th anniversary of this day in history and The Plaza, the "grassy knoll", and the Book Depository (where the museum is housed) were all very busy today. There were a lot of conspiracy theroists there, some men who were "at the scene" the day of the event, as well as many people who just wanted to pay tribute. We met one man who had traveled from California to see the museum, because he too shares his birthday with this date. 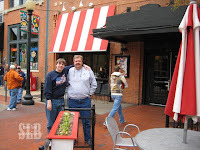 We started out by having lunch at TGIFridays in the West End. 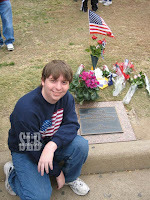 After lunch, we headed over to Dealey Plaza. We arrived right at 12:30 and there was a lot going on. There were sirens blaring as that was the moment in time that President Kennedy was shot. I have to admit it gave me a strange feeling to be standing in that area even though 45 years have past. 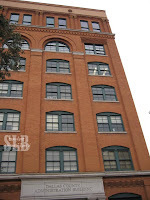 As we were walking towards the book depository there were a lot of reporters and people around. We say two older gentlemen and one of the reporters was asking them to recall what happened on that day. I can only imagine how they felt standing in that same spot some 45 years later retelling what they saw that day. If you look at the picture on the right you will see them and the book depository building is in the upper left hand corner. We continued up the street and arrived at the building. There was quite a long line to get into the museum but it didn't matter. It was interesting listening to everyone talk about that day in history. Several people talked about how the day had started out very nice with sunshine and how by the late afternoon the clouds rolled in and it was like the weather changed to fit the gloom that was hanging over the world. I do not remember this day, I was only three at the time but I do remember the day that Presiden Reagan was shot so I understand how this moment in time is so clear for so many people. Photographs were not allowed in the museum and I have to say that it is probably the first time in my life that I saw EVERYONE respecting that rule. The museum was crowded but everyone seemed to understand that and work together to make sure we all got to see what we wanted to see. It is a very good museum and all three of us enjoyed it. I personally was fascinated by the cameras and photographs that were taken by the ordinary people just out to see President and Mrs. Kennedy. I also noticed that while there were a lot of very clear photos prior to the shooting that during and afterwards most were out of focus. I can only guess that these people suddenly realized what was happening and became very shakey. I personally can't even imagine what it would be like out there snapping away happy as a lark to be seeing the President and then the next minute you realize you've just taken a picture of an assasination. I highly suggest to anyone in the DFW area to go and see this museum. It is well worth the time and money. The picture on the left shows the Book Depository building and the window from where the shots were thought to be fired from. It's the second set of windows from the top on the right hand side. The picture on the right shows the building from the street. 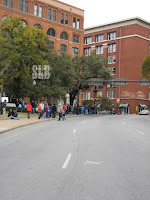 The X in the street is where the second shot hit President Kennedy. After we left the museum we took Cameron shopping for his birthday. You see, our son is a computer junkie. He is what you would call a "gamer." 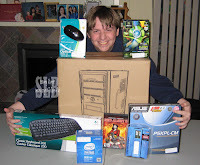 His current computer will not play most of the games he'd like to play so we told him that we would help pay for a computer upgrade. He's been saving some money and had asked all the relatives to give him money for his birthday. After a trip to two different Fry's Electronics stores, we made it home with everyt hing he needed to build a new computer. His computer maintenance course is paying off as he was able to build his computer this evening with very little input from Dad. As you can see from the photo on the right, he's a happy guy! While he worked on the computer, I put the finishing touches on his birthday cake. He has requested a special family recipe cake which I started yesterday (it's a two day process). 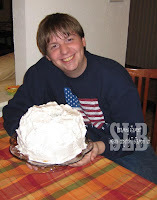 He (and my nieces) has always called it Goopey Cake but it's real name is Angel Food Fluff. I have to admit it's probably my favorite cake as well despite the time it takes to make it. 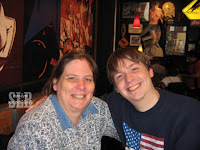 I can't believe this is my son's last year as a teenager. The years have gone so fast and he's grown up to be such a great young man. Thanks so much for letting me share his special day! What a great post, Sharon! Happy birthday, Cameron! How great that you were able to spend time with your son on his birthday! Sounds like you had a great time. Happy Birthday to Cameron (belated)! 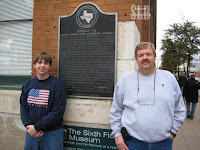 I took my family to the 6th Floor Museum a couple of years ago on President's Day. Amazing how you feel so close to that time in history when you are there.